A popular area loaded with vacation opportunities and many easy accessible passes full of alpines. Glaciers sculpted the French Alps, giving the corresponding valleys a mild climate and rich soil. There are a lot of towns in the area, for what at first glance might seem like an inhospitable and isolated section of France. In fact, the French Alps are full with well connected towns, and are popular year round, making them ideal for vacations in France. Divided into two providences, Savoy in the north, containing Mont Blanc, and Dauphine in the south, home to Grenoble, the main city of the Alps, the French Alps are a popular and diverse region. 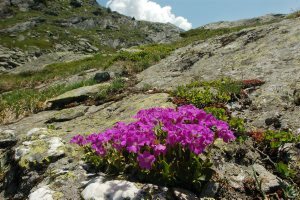 Inspiring craggy peaks and snow capped mountains rise up in the French Alps, where there are fantastic opportunities for plant hunters. Weather gives way very rapidly and varies from summer to winter. With pleasant weather in the summer the valleys open up to lush green fauna and fields of wildflowers. Hiking, as well as rafting, mountain biking, and canoeing are popular. Paragliding and skydiving are also possible. 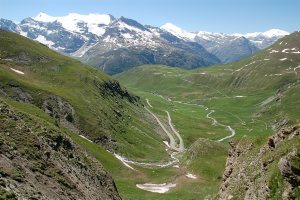 There are three national parks and four regional parks within the Alps: Vanoise, Ecrins, and Mercantour. Lanslebourg-Mont-Cenis is a pleasant small town from where many daytrips into the mountains can be undertaken. There is a small Campsite and several nice hotels. Mont Cenis is a massif and pass (2083m) which forms the limit between the Cottian and Graian Alps. 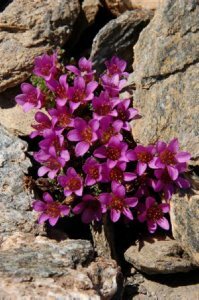 Both on Col du Mont Cenis and Col du Petit Mont Cenis are easy accesible and ideal places to botanize. You will find here all the color forms of Viola calcarata you can dream of. 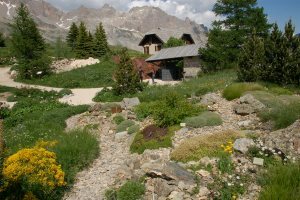 There is a Jardin botanique de Mont Cenis (an alpine botanical garden) located on Mont Cenis above the town of Lanslebourg-Mont-Cenis. The garden was created in 1976 at an altitude of about 2000m, and now contains about 800 plants. Col de l Iseran (2770m) is the highest paved mountain pass in the Alps in the department of Savoie in France It is part of the French Graian Alps, near the border with Italy. The Col de l Iseran is the highest pass in the Alps although the Cime de la Bonette (2802 m is the highest paved road (end-to-end) but is only a scenic loop road with start and end only metres apart at the Col de la Bonette (2715 m). The pass is part of the Route des Grandes Alpes. It connects the valley of the Isère and the valley of the Arc River between Val-d Isère in the north and Bonneval-sur-Arc (a very old town which you have to see!) in the south. 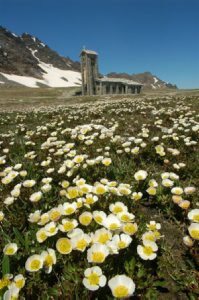 At the top of the pass near the small church there are thousands of Ranunculus glacialis but also Petrocallis pyrenaica and of course many other species. Briançon in the Hautes-Alpes department, at 1350m it is the second highest city in Europe after Davos and a good place to stay for several days because there is so much to see. Several high mountain passes are within 1 hour drive such as the Col du Lautaret, Col du Galubier and the Col d Izoard. Pay also a visit to the Col du Granon. 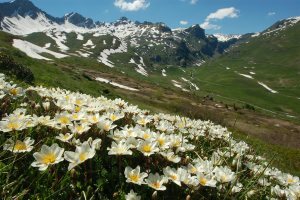 Col du Lautaret (2058m) is a high mountain pass and very rich in flowers. The col was modeled by a glacier which flowed down either side into the two valleys, and this explains the relatively easy gradient of the slopes by which it is attained. The Col is open all year round, and provides good views of La Meije to the south-west and the Grand Galibier to the north. Just before you reach the top of the pass you can see in June thousands of Narcissus poeticus in flower with several orchids in between. 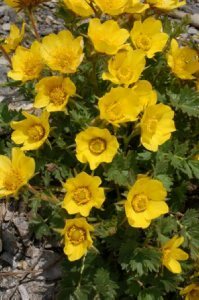 It is also well-known for its botanical garden, the Jardin botanique alpin du Lautaret A garden with 2 hectares located at 2100m altitude and well worth a visit. It is open daily in the warmer months; an admission fee is charged. The garden was created in 1899 by combined effort of the Touring Club de France, Professor Jean-Paul Lachmann of the Université scientifique de Grenoble, and M. Bonnabel, local hotelier. It was moved in 1919 to make way for a new road, and is now sited with excellent views of the Meije glaciers. The garden was abandoned during World War II, subsequently restored by Robert Ruffier-Lanche, declined again after his death in 1973, and revived in the early 1980s. 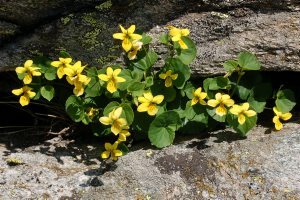 Today the garden contains more than 2100 species of alpine plants from around the world, and continues to be managed by Grenoble University as it has since its creation. Col du Galibier (2645m) is an other mountain pass with many high alpines like Geum reptans, Androsace carnea var. 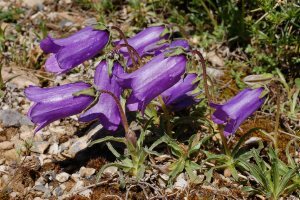 brigantiana, Gentiana orbicularis and many more. It is often the highest point of the Tour de France. Before 1976, the tunnel was the only point of passage at the top, at an altitude of 2556m. The tunnel was closed for restoration until 2002, and a new road was constructed over the summit. The re-opened tunnel is a single lane controlled by traffic lights which, at 2400m, must be amongst the highest in Europe. Col d Izoard (2361m) is a spectacular pass southeast from Briançon with barren scree slopes with protruding pinnacles of weathered rock on the upper south side. Here you can find the endemic Berardia subacaulis in the limstone scree growing almost next to Daphne cneorum (dwarf forms) and many Viola cenisia.